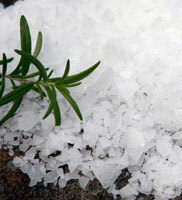 Home > Shop All Products > Magnesium Flakes > Magnesium Flakes 10 lbs. These ancient minerals are the cleanest sea minerals we have found. 31% magnesium, 80 trace minerals and low sodium. Trans-dermal magnesium therapy is well known to relieve pain in joints and muscles. One cup flakes in hot water for thirty minutes to one hour in a bath will give you a feeling you have not felt in many years. The effect is like making you a wet noodle and pouring yourself into bed.